Description: The Escaich concerto, as will be anticipated by those who have enjoyed the composer's splendid organ concerto and other works we have previously offered, is a work of great communicative power, and one which perfectly balances seriousness of intent with lively, engaging discursiveness. The piece has the nature of a symphonic poem, with virtuosic trumpet obbligato; the musical argument is equally shared between soloist and orchestra. From its ominous opening, a cry from the depths over an obsessive pedal note in the orchestra, it is apparent that the piece is more than a virtuosic showpiece, but in typical Escaich style it manages to be that to a delightful degree, with energetic rhythmic propulsiveness and a true sense of tonal progression, in addition to its very Romantic sense of conflict, progression and resolution. Ohana requested that his Concertino not be published until after his death (for unknown reasons), and this recording is its first outing since the premiere in 1963. In three short movements, it is a vital and accessible work, despite the considerable rhythmic intricacy of the accompanying material. Suggestions of Spanish/Moorish dances and modal melodies abound throughout this attractive work. Bacri's work is a tribute to Bach, a jazzy modern-day successor to the Brandenburg Concertos; tonal with carefully controlled dissonances and ambiguities, and a virtuosic and eloquent solo part. 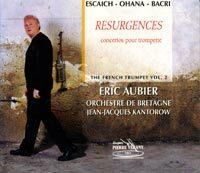 Eric Aubier (trumpet), Orchestre de Bretagne; Jean-Jacques Kantorow.